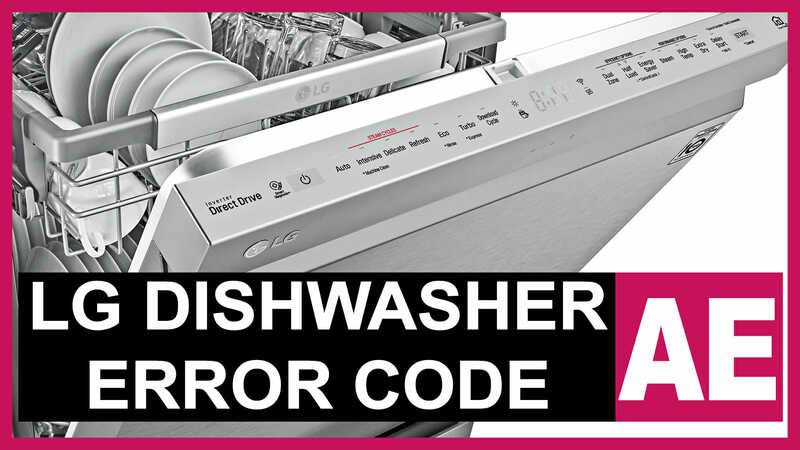 The AE error code means that LG dishwasher is leaking. The manufacturer provides information that this error often occurs due to excessive foaming in the tub. You may have got a wrong dishwasher detergent or the amount of the detergent was excessive. But not only these factors may cause the code to appear. The drain hose is broken at the bottom of the dishwasher. The drain motor is leaking. The tub has got a breach. The bottom panel is damaged. Drain system clogs may cause water to leak to the bottom panel. Start with the drain hose and the sewer. Check if the water is running down the drain properly and if the connections are tight. pull it out and rinse under the tap. You can use a brush to clean it. Disconnect the filling hose and inspect the inlet valve. If it has some traces of rust on it, replace the part. Check the mechanical part and the openings for clogs. In order to check the pipes, you need to get access to the bottom of the appliance. Disconnect the appliance from the communications and place it on the back panel. Unscrew the bolts or loosen the latches on all sides of the bottom panel (if any in your model). There is a water leak sensor under the cover. Its float is made of a piece of foam. It is the sensor that gives a signal to the control board that a leak has occurred, and the system displays the AE error code. Disconnect its connectors now. Once you have got access to the parts, inspect the pipes for being intact and their connections for being tight. If the pressure switch is located at the bottom (or back) of your dishwasher, disconnect the hoses leading to it. Disconnect the wiring and remove the sensor from the housing. Check the water level sensor for clogs and use a multimeter to check the contacts. If the fault is obvious, install a new part. Bottom leaks are often caused by the damaged hose of the dishwasher. If it is weakened or its seal is cracked, it will result in puddles of water. No device is safe from this, as all hoses wear out over the course of operation. So they require replacement from time to time. It may not only be the wear but also an ordinary clog that causes the malfunction. It obstructs the water flow, so some water remains in the tub. As a result, the sides get rusty and the seals get damaged. It is necessary to better keep the tub, drain, and filters clean to avoid it. Another usual problem is the gaps through which water can flow to the bottom panel. So the code appears on the LG dishwasher display. Sometimes it is a poorly closed door latch. It can be damaged or bent, so the water is flowing under the appliance. The rubber seal contacts chemicals and is used in high-humidity conditions constantly. All this leads to physical damage, and eventually, the seal becomes unusable. It shrinks, breaks, and cracks. If it is the seal, you will see the water leaking from the door. What if it is the drain pump seal or the seal of other part designed for moisture protection? Then the liquid will accumulate at the bottom, under the very dishwasher. reinstall the panel in its place. Some LG dishwashers can leak if the jet going from the spray arm has a wrong direction. During some cycles, the water is heated to high temperatures. As a result, the holes of the spray arm get clogged over time and the direction of the jet may change. It is a rare but possible case when the spray arm delaminates because of water pressure. So the water gets on the bottom panel. Most often, the spray arm is located under the rack. The spray arm is latched. Just pull out the part with a screwdriver, and install a new one. Most dishwashers have some water leak protection system. It is essentially the same in all dishwashers: there is a float switch on the bottom panel. If it gets any water, it will signal to drain. It is, in fact, the Aquastop system. Even a small amount of water triggers the sensor, and the control panel shows the AE error code. The device stops filling, drains the water and gives a sound signal about the leak. Leaking LG dishwasher and the code are quite unpleasant things. All the above tips focus on the fact that you need to find where your dishwasher is leaking. You can do it yourself or consult a specialist.